ACAL has been working hard this month. As Vice President, I have temporarily taken over some of the responsibilities of the ACAL president, Jenni Anderson, while she is taking some time off regular ACAL duties due to personal reasons. I have been working with the office bearers and the wider ACAL committee to continue the President's work and I am heartened by the commitment and engagement of the ACAL community. Please continue to send in your stories and information relating to the history of ACAL as we compile this to record our history in recognition of the 40th Anniversary this year. The call for papers for the 2017 ACAL Conference in Darwin is extending into April. Proposals will be considered up to April 30. Wider preparations for the Conference are really ramping up and the NT team are looking forward to welcoming you in September. 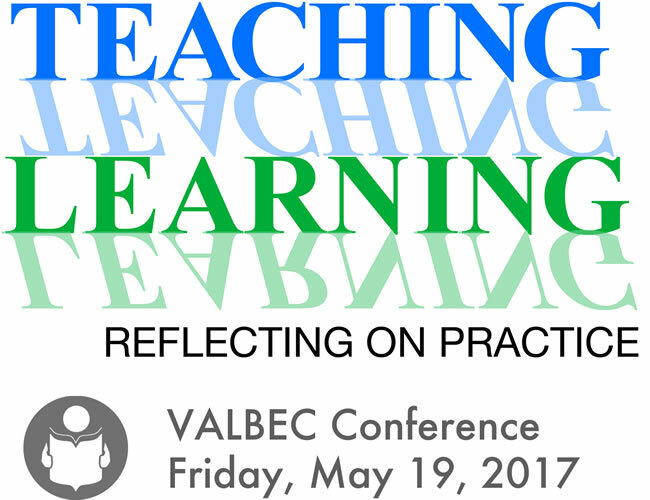 With keynote speakers confirmed and many exciting proposals received, I look forward to sharing some announcements with you soon. Stay tuned! Over the past month there have been workshops around the use of the Foundation Skills Professional Standards Framework. I attended the Melbourne workshop and appreciate the time and energy that has gone into this work. Further information is included in this edition and feedback from the field is so valuable. ACAL will prepare a response at the end of the consultation period so you might like to send your feedback to us or directly to Louise Wignall and Anita Roberts. PwC are continuing their review of the FSK training package. Please see the call to respond so that your experiences and expertise can help inform this review. ACAL is moving into the social media world as a Facebook presence is being developed. We look forward to developing and extending our outreach so we can connect with you. Our beginning site can be accessed on https://www.facebook.com/acal.edu.au/ and we look forward to seeing this grow in 2017. Please email us at info@acal.edu.au input for our 40th anniversary year or with feedback as we'd love to hear from you. As the 40th Anniversary year for ACAL is a significant milestone, there will be the opportunity to reflect on the timeline that has brought us to this point and to celebrate the rich history that we share. If you have anything that you think captures critical moments in this shared history, please send them to info@acal.edu.au as we would love to hear from you. With the keynote speakers due to be announced soon and the details of fabulous opportunities to engage with the colour and character of Darwin, we hope you can start planning your attendance for September this year. Members may be aware that a number of tools have been developed to accompany the Foundation Skills Professional Standards Framework, in order to assist practitioners to map their capabilities against the framework. These were introduced to practitioners at series of meetings which were held around the country in previous weeks and will be followed by a series of webinars to publicise and interpret the framework more widely. 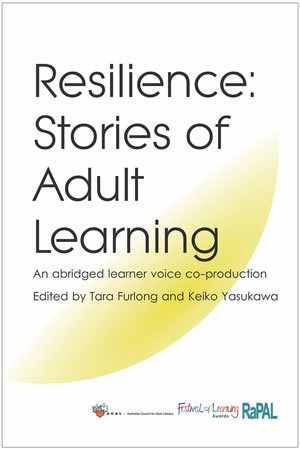 Louise Wignall and Anita Roberts have asked for feedback from the field; and we urge you engage with the webinars and consider the use of the framework in your context so that a range of responses from the field can be considered. In February the Reading Writing Hotline launched its 'LLN in the Workplace' project to promote the services of the Hotline to industry, and ultimately to promote the benefits of a focus on the importance of developing appropriate LLN competencies for workers. 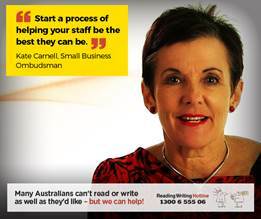 Kate Carnell, the Small Business Ombudsman starred in a promotional video. We remind you that PwC's review of the FSK training package is underway, and that we still have an opportunity to have our say. We urge you to complete the survey so that the views of a range of practitioners will be made known. The 2017 Australian Training Awards’ Excellence in Language, Literacy and Numeracy Practice Award is open now for nominations. Entries close Wednesday 31 May 2017. 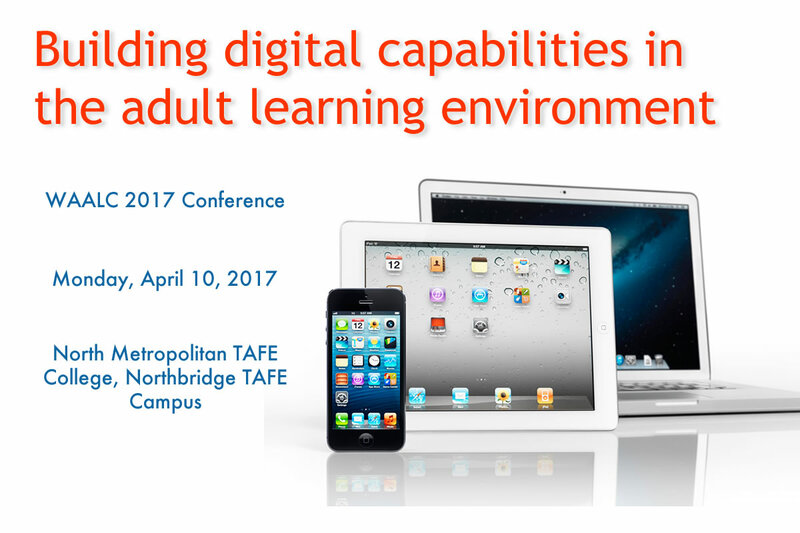 This year's state Western Australian conference Conference has been delayed from April to 14th July 2017. The first keynote speaking Helene Markmann on 'Digital Technologies to Engage and Connect Learners'. Keep an eye on our website for updates. Call for papers has been extended. Make your contribution right now! It is a busy time for course accreditation in the west. If you want to keep up with changes to the WA suite of courses, visit our teacher network at alan.spruz.com. Search for CAVSS, USIQ and EGE: reaccreditation for all of them is in progress right now.